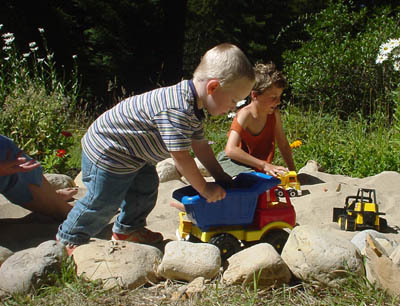 What young child doesn't, at some point, have a fascination with big machines? One of my daughter Lassen's first words was "backhoe". She was a toddler when some work was being done at the end street and whenever she heard them rumbling past the house, she'd to the window screeching, "Backhoe! Backhoe!" 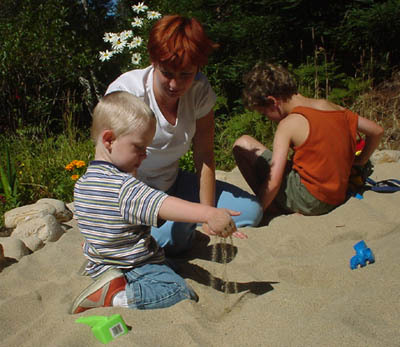 All through her preschool years she'd insist we stop to watch road work or construction sites. We thought she might grow up to be a heavy equipment operator. 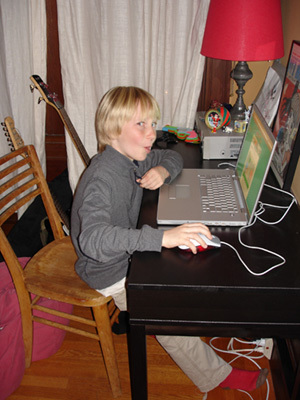 But it was my grandson Emmett, who directly inspired this book. 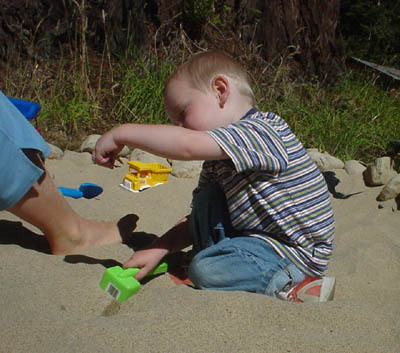 In the park one day I watched as he scooped his hand into the sand, then lifted and dropped, making the rumbling noise of a backhoe at work. 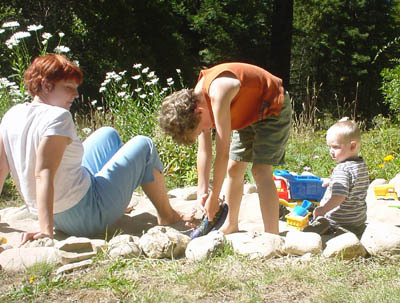 I wrote the story and later did a photo session with Emmett, then two years old. It was 2003. 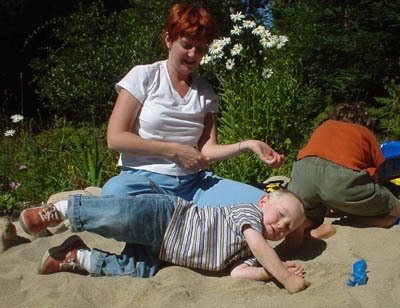 Big cousin Jacob was seven, still young enough to enjoy sand and truck play. ... and here a bulldozer. Jacob was a bit long to take the role of toddler, but when Emmett didn't understand, or got tired of cooperating (he was two after all), Jacob did some posing to help out. A few months later we had another photo session with Dad. I still didn't have all the photos I needed, but I prepared a sketch dummy and sample illustration and began submitting the story. 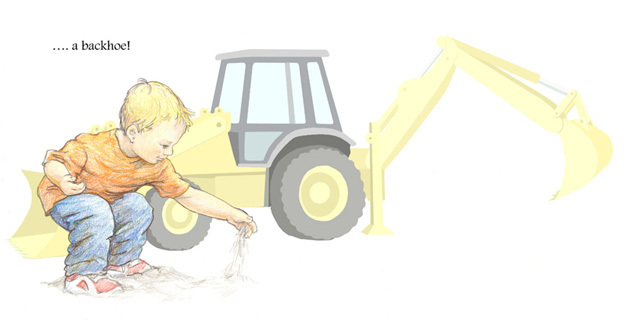 Emmett is three and half here, posing for the dump truck pictures to help me refine the drawings for my dummy. 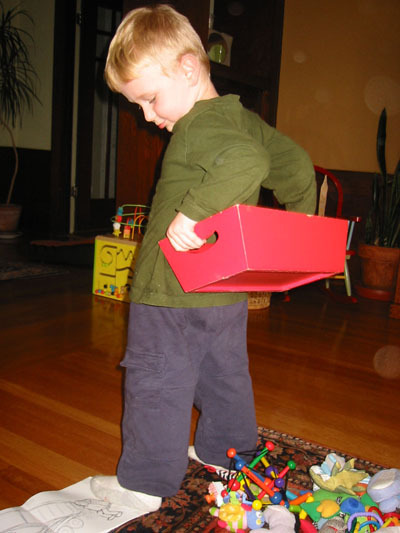 My rough dummy is on the floor so he can see what I want him to do. This spread is from the dummy I submitted. 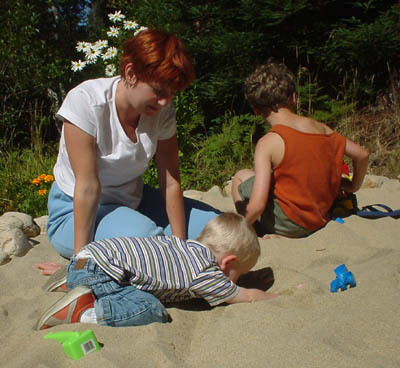 Mom was in this version, signaling that playtime is over, helping with the toy clean-up, and loading the dump truck with the child's PJs. This is my sample illustration. 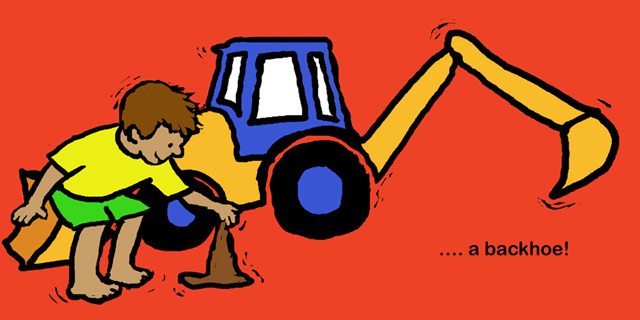 After drawing the backhoe I tried giving it a different treatment--very flat--to indicate that it is not in the same "real" world as the child. I did this backhoe using PhotoShop. Back in the eighties, when I first began using a computer for writing, someone suggested that I'd be doing art on it one day. I scoffed. Art on the computer? Never! But bit by bit I'd slipped into designing my quilts using PhotoShop. Once you have a design drawn, that little fill tool makes it so easy to try different variations. 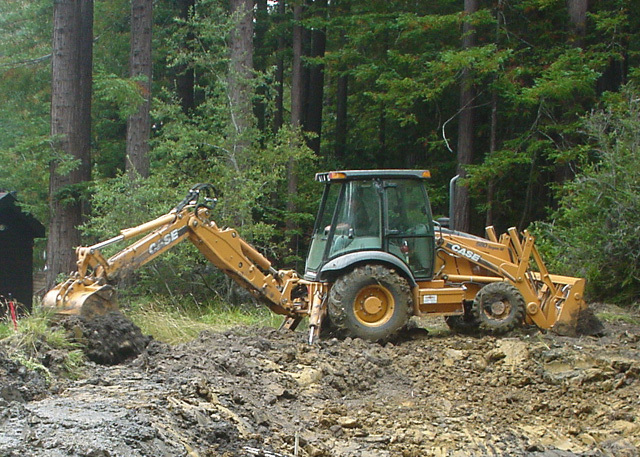 The Backhoe manuscript was rejected thirteen times. "Too many truck books already," was the reason most frequently given. Emmett's mother said, "There can never be too many truck books!" Emmett would have agreed with her. So I kept trying. Finally, in 2008, Kim Keller at Tricycle Press, mother of a little truck-lover herself, saw the book's potential. She loved the idea, but wondered if the illustrations could be brighter, bolder and more up-dated. "Maybe a strong black line," Kim suggested. 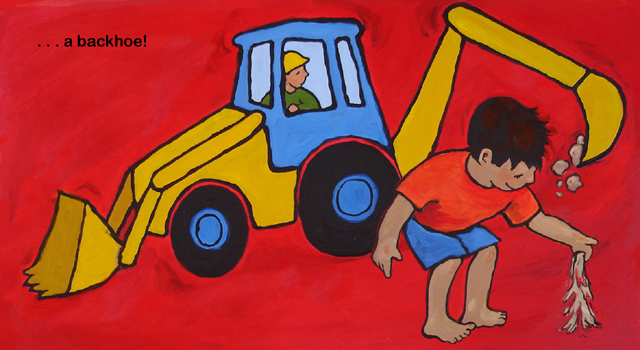 I was in the middle of other work, but did this quick sketch of the child and backhoe in PhotoShop, thinking that, if it was the right direction, I could paint the pictures with acrylics, using the strong outlines and bright bold colors. Kim liked it, as did her boss, Nicole Geiger, and wondered if I could just do all the art for the book in PhotoShop. Yikes! Looks like "never" is now! I had bought Corel Painter a couple years before, but never used it. I did a couple tutorials then some experimenting. Painting this bulldozer was fun! Designer Chloe Rawlins got involved, we did this test print, and it was decided. The art would be digital. I still had a lot to learn. What file format for the final art? How many dpi? Questuions I'd never had to ask before. The first big challenge, other than learning more about using Painter, was the color. The book would be printed in CMYK color (Cyan, Magenta, Yellow, blacK). 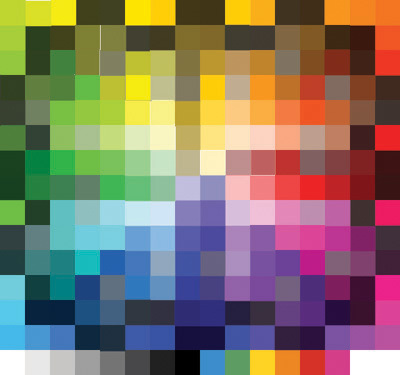 These are the colors of ink used in virtually all four-color process printing. The workspace in Painter is RGB (Red, Green, Blue) which, rather than creating colors from ink, creates them from light. (For a better explanation check Wikipedia CMYK and RGB). Using RGB it is possible to create almost any color, not all of which can be duplicated using the CMYK ink colors. When I converted my early efforts to CMYK they looked horrid! Nothing like the bright clear colors I was seeing as I worked! Another challenge was to get the right amount of detail on those big machines. I expected to keep them really simple, kind of whimsical, but Kim encouraged me to make them more realistic, with appropriate identifiable parts. ...and this of one of Emmett's toy. The toys gave me good clues about how to simplify, keeping all the important parts, but letting some of the intricate workings go. I had hoped the art would stay as loose, active, and bold as the early samples--a new style as well as a new medium--but as I worked in response to comments from Kim and Nicole to get the facial expressions, as well as those machine parts, accurate, the art morphed into something closer to my old style, but a lot brighter and bolder. I love what Chloe did with the endpapers! So here I am in "never" land, looking forward to doing more digital art. It's amazing what one can do on a computer these days. I barely scratched the surface of the possibilities with Painter. My original inspiration for BACKHOE, who will turn nine in a few months, is already making his own stop action movies and teaching himself After Effects. It's a whole new world. 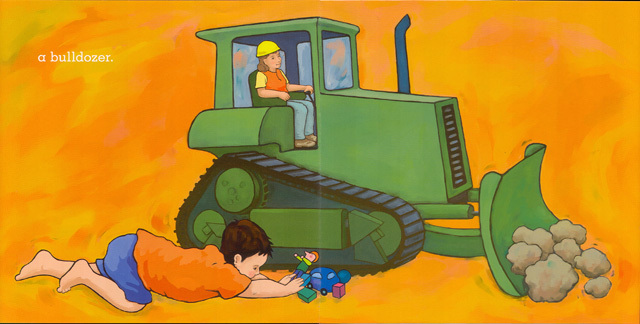 Like many young boys, this book’s protagonist marries an active imagination to a love of trucks. 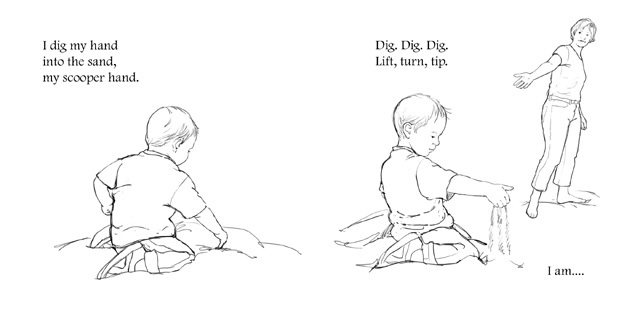 In a layout perfectly designed for the youngest readers, Hines uses one double-page spread to show the young boy acting out the motions of one of his favorite trucks: “I dig my hand / into the sand, / my scooper hand. / Dig. Dig. Dig. / Lift, turn, tip. 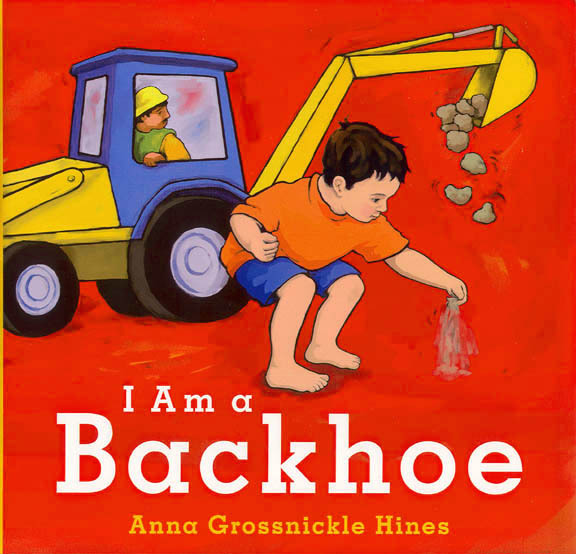 / I am... // a backhoe”with a turn of the page that reveals the boy still engaged in pretend play but with the actual truck massively in the background, also performing the same action. 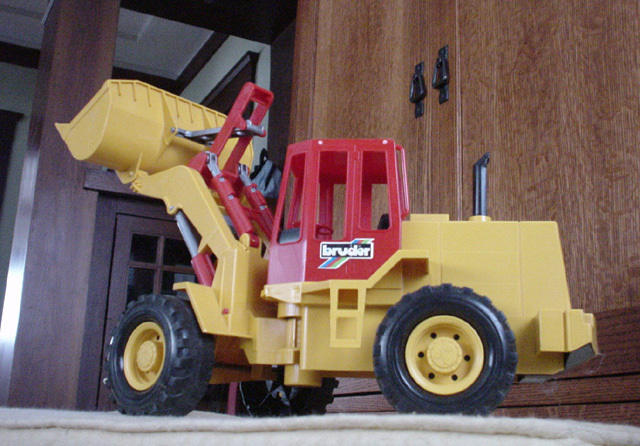 The trucks include the titular backhoe, a bulldozer, crane truck, dump truck and roller. 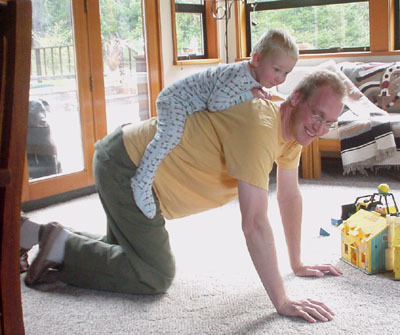 In a wonderful ending segue, Daddy the flatbed truck backs the young boy up onto the couch, where they share a book together. The digital artwork has a soft look and feel and features vibrant colors for both the clearly outlined objects and the blank backgrounds. Spare text with a simple vocabulary makes this an excellent choice for both toddlers and those who are just beginning to read. The author has turned an ordinary (and overdone) topic into something extraordinary.